In 2010, George Soros announced he would be giving $1 million to Media Matters to “hold Fox News accountable for the false and misleading information they so often broadcast.” Translation: Soros-funded Media Matters to combat Fox News, something it ostensibly labeled as “fake news,” an apparent smear tactic deployed as a result ostensibly progressive agenda. Fast-forward to 2017, and the billionaire trouble-maker is now using his influence at Media Matters to combat “fake news” on Facebook, except this time they’re trying to keep it secret. When Facebook announced at the end of 2016 it would be working to eliminate “fake news” stories on its social media platform, many news media organizations, including The Free Thought Project, were understandably nervous, and with good reason. Not long after the announcement was made, TFTP was banned by Facebook for over two weeks, only having their account restored just days before the start of the New Year. The Washington Post also put out a hit piece targeting TFTP and others, which has since been retracted, in a blatant attempt at smearing their critics. 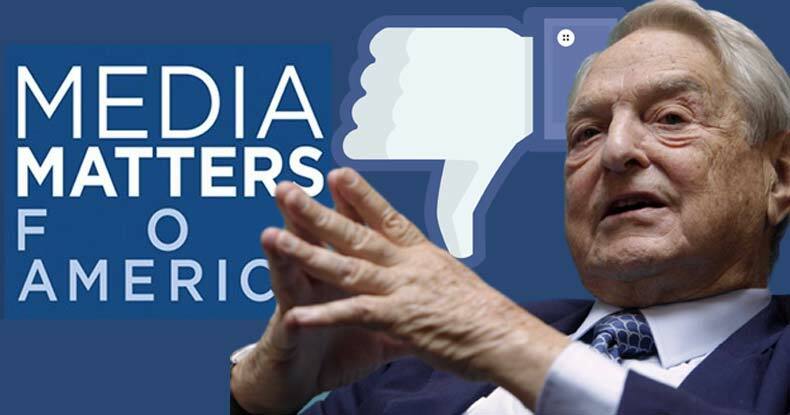 Now, it seems, we know who is behind this Facebook crackdown on alternative media, the George Soros-funded Media Matters. According to The Free Beacon, it was revealed through internal Media Matters documents that Media Matters was quietly working with Facebook to identify and eliminate fake news and propaganda. “Media Matters told current and prospective donors at a retreat in Florida over the weekend that it has been in discussions with Facebook leadership about their policies on inaccurate and partisan news stories on the website that many liberals blame for political losses last year,” the Beacon writes. According to a “briefing book” given to attendees at the Media Matters conference and obtained by the Beacon, the left-wing news organization admitted, “We’ve been engaging with Facebook leadership behind the scenes to share our expertise and offer input on developing meaningful solutions.” Facebook promised that “Media Matters will serve as their partner,” in having a more active role in combating what it will determine is “fake news.” In other words, Facebook, and its CEO Mark Zuckerberg, are working with the militantly progressive news media organization to silence any organization it deems to be “fake news” which are little more than news sites who challenge the status quo. If this doesn’t seem fair, that’s because it isn’t. It goes against every principle of journalism, free speech, and freedom of press the country has historically defended tooth and nail. By its own admission, Media Matters is censoring free speech on Facebook, and all with the company’s blessing. The soon to be scandal for Facebook is the latest in a long series of scandals which has targeted the free speech rights of certain individuals, and organizations. Facebook announced on Wednesday that it would change the algorithm behind its popular “trending topics” section, which will now base popularity on the number of Facebook-designated publishers discussing a story, rather than the number of users discussing it. Google also said on Wednesday that it has banned 200 publishers from its advertising network as part of its efforts to combat fake news sites. The company refused to say which sites had been targeted.